The Fresh Music Page has been Whitney Houston central. I love Whitney Houston and at her peak she possessed one of the most powerful and the most beautiful voice that anyone has ever heard. Her tone was that of an angel. However, Whitney is now 46 and she's coming back from hell. The name of the album could have surely been "Back From Hell". I saw her performance on Good Morning America and it wasn't good. The once angelic tone is now gone but we knew that from her latest album. She put a lot of energy into each of her performances but the voice, yes THE VOICE was just not there. No upper register and she avoided the high notes like fat people avoid the gym. It wasn't good and you will not get any spin here. 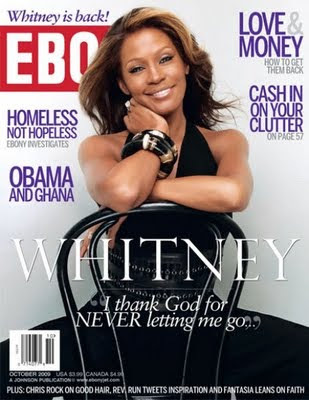 I do not work for Whitney Houston and it is not my job to make her look good. I'm honest and I will always say what I feel. I know that most bloggers aren't too honest therefore I feel that somethings about the Whitney Houston performance should be cleared up. Whitney did NOT cut the concert short because of voice problems. She was only suppose to perform two songs: "I Look To You" and "Million Dollar Bill". The extra two she added in was "My Love Is Your Love" and "I'm Every Woman". On the performance of "I Look To You" it does seem like she was out of breath quickly but she did just perform "Million Dollar Bill" before that. "I Look To You" is not a song that Whitney should be working the stage on, like she was doing. She needed to stand still and concentrate on the song. She showed signs that her voice was there...somewhere hidden in all of that roughness. Whitney Houston is a legend and after one performance I won't tell her to sit anywhere. You can't expect "I Will Always Love You" Whitney Houston. I'm waiting to see the Oprah interview and performance. By the way "I Look To You" the album is HOT! I love it. Yeah, it was a bit disappointing. But still, it must be very nerve wrecking to perform live after all this time (and after all what has happened). I think she'll do better next time!